During his NIU days, award-winning chef Paul Kahan studied computer science and a career in culinary arts hadn’t crossed his mind. Today, Kahan runs seven Chicago restaurants, including the nationally known Blackbird, avec and The Publican. 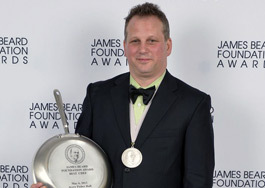 He won the Outstanding Chef Award from the James Beard Foundation in 2013 and was named Best Chef of the Midwest in 2004. Although the awards have given him national recognition, Kahan considers mentoring young chefs as his biggest accomplishment. “I have won my awards; what I love is cooking and teaching,” he says in his biography at OneOffHospitality.com. One Off Hospitality Group is the management company for the restaurants. Kahan was introduced to the food business through his father’s deli and smokehouse in Chicago. As a youth, he removed fish from brine, hung them on racks and wheeled them into the smokehouse. He attended Northern on a wrestling scholarship and graduated with a computer science degree in 1986. After working in computer science for a few months, he took a job in the kitchen of Erwin Drechsler’s Metropolis, where he realized his true calling and spent 15 years there. Today, he is considered one of America’s most influential chefs. Despite his busy schedule, Kahan finds time to support Alex’s Lemonade Stand Foundation, which fights childhood cancer, and Pilot Light, a group dedicated to enhancing children’s perception of food through hands-on education.